The Garcia Institute of Modern Excellence offers a variety of modalities and techniques to improve posture, eliminate pain and prevent injuries. The goal is to help each person achieve optimal performance and to improve overall quality of life. The bones do what the muscles tell them to do. The muscles do what the brain tells them to. Common muscle imbalances and improper movement patterns, can create wear and tear on the joints, chronic pain and inhibit overall performance progression. At GIME, we address the underlying cause to pain and movement dysfunction, by reviewing the nervous system, the muscular system, integrity of the tissues and overall stressors delaying positive results. Our goal is to deliver the largest amount of results in the least required sessions. Contact us today for SOLUTIONS! We look forward to helping you achieve YOUR BEST! The initial evaluation is $199, your best investment up front. Buy 10 sessions get one free. $120 per hour/ $60 per half hour. Any or all services we offer, including AminoNeuroFrequency discs, laser therapy, mps therapy, at home programming, medical care advocacy and 24/7 contact with your restorative health coach. You are retaining our services to advocate for your best health. 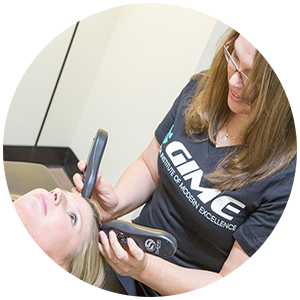 Email info@gime.us or call 352-428-6368 to reserve your comprehensive evaluation today.